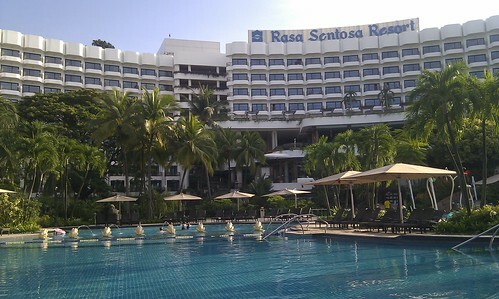 Snapshot Singapore: Rasa Sentosa, a photo by nina_theevilone on Flickr. The invitation came last May, and I’ve been so excited for this trip since. hotel or resort in Southeast Asia. Nice! Looks like it’s family friendly. Also, is the resort all-inclusive? Not all-inclusive, but definitely family friendly! They have a kid’s zone where kids get to do play and do activities like crafts and art while you relax by the pool. Sounds enticing no? YES! Any place where you can leave your kids to their own devices while you sip on cocktails is worth a visit! Did you take a dip in the pool yet? I know you’re working, but you gotta have some play time, yeah? I would like to stay in a luxury hotel like this! wow! the pool looks so inviting! good thing it wasn’t crowded. Looks awesome — a good choice to consider when staying in SG. Hi, nina. I really want to travel to singapore this coming December. But I’ve never been out of the country before, so I have no idea how much cash should I set aside to experience singapore for like a week.